Christine Elliott: Personal bio graphical details. The needed debate about policy, direction of the party, where it stands. One question that matters. What the speaker has and wants to fight for. The tax burden on working families. The speaker’s plan to address that. Making it easier for small businesses. Addressing crime and the rights of victims. Values of the Conservatives. The Human Rights Tribunal of Ontario and why it should not be scrapped. Being serious about wanting to win the next election. Concluding remarks. Frank Klees: Being in government better than being in opposition. The call to action on the economy. The need for leadership. What it will take to get us out of this recession. What it will take to unleash the potential in Ontario. The speaker’s experience. Steps that need to be taken. Changing how government works altogether. Invigorating party membership. Developing policy. Fiscal and social responsibility and making the balance work. Concluding remarks. Tim Hudak: Ontario on the wrong track. Deep concern about Ontario’s future under the liberal government. Why the speaker wants to lead the party. Sticking with conservative principles. What will bring the PC Party of Ontario to victory in 2011. Some personal biographical details. Running on a platform of renewing values, the party and the province. Two examples. Some concluding remarks. Randy Hillier: The speaker’s introduction as a dark horse. Knowing what doesn’t work. What happened in the last election. The factor of apathy. The conservative nature of people in Ontario. What will work for them and the Conservative Party and Ontario. What the Conservative Party can do for Ontario. Concluding remarks. Helen Burstyn: President, The Canadian Club of Toronto, and Chair, Ontario Trillium Foundation. To moderate today’s event we have Larry Stout who has spent 48 years as a journalist working in print, radio, and television. He spent 23 years with CBC News reporting on national elections and leadership contests, including the conventions that elected Pierre Trudeau and Jean Chretien as Liberal leaders, Robert Stanfield and Brian Mulroney as Conservative leaders and Tommy Douglas and Ed Broadbent as NDP leaders. You could say that Larry “has perspective.” Larry then joined CTV News in 1989 and in his “post retirement” continues to provide professional development and training, as well as occasional news anchoring. Please join me in welcoming Larry Stout who will capably guide us through today’s proceedings. It is a pleasure to be here today and I must admit that it does bring nostalgia to my particular career because it did begin with John Robarts becoming the premier of Ontario. I covered that for the first time. I was working for a radio station called CKEY. Some of you who are older will remember that station. It is now The FAN 590. Anyway this is a very special event to be able to take part in and I am really, really looking forward to hearing what our candidates have to say. Over the years I have got to know so many of our premiers in Ontario—John Robarts, and of course Bill Davis, Frank Miller, David Peterson, Bob Rae—and as a reporter I think you tend to try to be as fair as you possibly can. Fairness is really what it is all about and one of the things I discovered about the politicians with whom I had a story line was how fine they were. I think we’ve had terrific premiers of Ontario beginning at least from my perspective with John Robarts. And I’m sure that the people here, who hope to be the next premier of Ontario, will also have that kind of real attitude toward the people and the province of Ontario. So let’s begin now to hear from these people. Do they have eight minutes or is it 10 minutes? It is eight minutes. I thought so. First to speak is Christine Elliott. Now she is the MPP for Oshawa-Whitby. Prior to her life in politics she was a lawyer. She started her own law firm and practised real estate and corporate law. She is the wife of our federal finance minister Jim Flaherty and the mother of three 18-year-old boys—triplets. And I’m going to sit next to her today and figure out how she can do it all, but she’s obviously done very, very well and it is a pleasure to introduce you to Christine Elliott. Well thank you very much Larry. Ladies and gentlemen, officers of the Empire and Canadian clubs, and members of the PC Business Association, thank you for organizing this event and for inviting us to join you here today. My name is Christine Elliott. I’m an MPP, a mum to 18-year-old triplet sons, a professional, a small businesswoman, a community volunteer, and the last person in the world that Dalton McGuinty wants to become the leader of the Progressive Conservative Party of Ontario. For the next six weeks we are going to have a debate in our party. It is one quite frankly we need. It will be a debate about policy, about the direction of our party, about where we stand. Underlying it all there is really only one question that matters. Who has the plan to beat the Liberals? Who can reach out and appeal to all those Ontarians who share our values but who are not traditional PC voters? Who is ready not just to lead but who is ready to be premier? As a long-time volunteer and MPP, I’ve always fought for the things we believe in—lower taxes, smaller, more efficient government, the rule of law. I’m fighting for those things now. The tax burden on working families is too high and it’s getting worse. Ontario families pay more in taxes than for food, shelter and clothing combined. The time for tinkering with the tax code is over. Extraordinary times demand old measures. I will phase in a single-rate flat tax where everyone especially lower-income families will see their taxes go down. It’s fair, it’s simple, it works and, most importantly, it allows you to keep more of your own money to spend, save, or invest as you see fit. The federal EI program is unfair to Ontario. Ontarians who pay into EI during the good times should get benefits in the bad times just like they were promised. If the federal government will not fix it, then we have no alternative but to take on that responsibility ourselves and to create a made-in-Ontario solution. I will make it easier for small businesses choking on red tape. I will stop the minimum wage increases and work-week restrictions that are killing small businesses and hurting the poorest Ontarians. I will make sure that crime never pays and that the rights of victims always come ahead of the imagined rights of criminals. These values are part of our DNA as Conservatives, but I believe that there is another tradition too—one that we need to proudly reaffirm. Compassion is a part of the legacy of our great party and it’s deeply embedded in the people of Ontario. We have to make it easier for people to express their kindness and desire to help others. There are so many wonderful charities out there that bring services and programs to people who need them. They do a far better job than government ever could. So I’ve proposed doubling the provincial tax credit for charitable donations. I want you to know that any Progressive Conservative government I lead will never forget its responsibility to make sure that no one is forgotten or left behind. Last week Tim, echoing an earlier announcement by Randy, called for the Human Rights Tribunal of Ontario to be scrapped. In my view that would be a mistake. We all know that the commission and tribunal are flawed and are venturing into areas where they have no business. And they have been hijacked by groups whose aim is to stifle open debate and free speech. These are abuses that must and will be stopped. But to scrap them altogether would hurt those who suffer from real discrimination. I’m talking about discrimination in the workplace, denying people a place to live, sexual harassment, protection for those with disabilities. These are the people the system was meant to help when it was founded by the Progressive Conservative government of John Robarts in 1962. People who are vulnerable and who lack the means to fight for the rights through the costly legal process. We must return to that original mandate. Premier Robarts said, “There are two principal and closely interrelated purposes. The first is to make secure in law the inalienable rights of every person and the second is to create a climate of understanding and neutral respect so that every person will be afforded the unhampered opportunity to contribute his maximum to the enrichment of our society, of our province, and our nation.” Ladies and gentlemen, surely as a party we must recognize the dignity and worth of every person and to guarantee equal rights and opportunities without discrimination. But there is another issue here as well. Are we really serious about wanting to win the next election? I know I am. If we take the position that Tim is advocating, it would be a gift to the Liberals. One that they would exploit as ruthlessly as they did the issue of faith-based funding. Why on earth would we want to expose ourselves by plunging recklessly into such a controversial issue? Just like faith-based funding, this is a policy that was made with the short-term goal of winning a leadership campaign. If we are going to beat the Liberals we have to show better judgment than that. To show I’m serious about winning I did something different. I launched a tactical campaign plan—the path to victory. It is a detailed step-by-step road map to take us from now until October 2011. It is a plan to build the machinery we need to beat the Liberals. As the next leader of the PC Party of Ontario, I will leave no stone unturned to ensure that we are ready to win the next election. I would be honoured to have your support. Thank you very much. And thank you very much. Our next candidate is Frank Klees. He is the MPP for Newmarket-Aurora. He was first elected to the provincial legislature in 1995. He served as Minister of Tourism in 2002. He is now caucus chair for the Official Opposition and critic for both the Ministry of Transportation and the Ministry of Public Infrastructure. Before entering politics Frank worked in the financial-services industry. He is married and has two adult children. Frank Klees ladies and gentlemen. Thank you Larry. As you were doing that introduction it reminded me of the time that we were in government and I have to tell you it is a lot better being in government than being in opposition. In fact I recall about two months after losing the election being on a flight to Ottawa and a young lady was sitting in the aisle across from me. She kept looking at me and obviously I thought she recognized me. So I introduced myself. I said, “Hi. I’m Frank Klees.” She said, “You used to be somebody, didn’t you?” And that was one of those moments where you realize that people respect the office and they forget about the person pretty quickly. It actually reminded me of another point when I was reaching for my dose of inspiration which I always do every morning, the Toronto Star. This was the day after I made a call in Parliament to the premier to strike a select committee of the legislature to deal with the economy. This was before the term global recession was even on the radar screen. I called on the premier and I said, “Look the clouds are gathering. We need a succinct economic plan for the province,” and he dismissed it. Well here is the editorial of that Toronto Star that I picked up and I could not believe it. There in the editorial of the Toronto Star was an endorsement. They actually used my name. An endorsement of that call for action on the economy. So this was the first time in 14 years that the Star aligned with me on an idea that I had brought forward. But my friends, against that backdrop, the premier then brought us in a budget in which not only did he not strike an economic plan for our province but he asked each and every one of us and our children and grandchildren to sign a promissory note for some $14.5 billion of deficit. He then to make that pain go away struck us with another $2.5 billion of taxes on a thousand products and services that have never been taxed before called the HST and then to make us all feel really good about three weeks after that he collected Ontario’s first welfare payment compliments of the federal government because of his great stewardship as leader of our province. My friends, we need leadership. I respect my colleagues tremendously, I consider them all three friends, and they bring their own perspective to this race, but here is why I am in this race. I believe that during these difficult economic times that the premier of this province must have a sense of the real world of business, what it takes to get us out of this recession, and what it takes to unleash the potential in this province of its entrepreneurs and its businesses. I had 25 years of business experience before I was elected. I know what it’s like to build a business from scratch. I know what it’s like to meet a payroll. I know what it’s like to create jobs and I know what it’s like to fight government red tape and bureaucracy and I want to change that on behalf of businesses and entrepreneurs in this province. The first step that we need to take is to re-invigorate a red-tape commission that is mandated to cut across every single ministry of this government and strip out the unnecessary red tape and regulatory burden that is suppressing the entrepreneurial spirit and that’s keeping our businesses from doing business. That would be the first step. It will cost government nothing, but I believe that it will revive business in this province. Next I want to change how government works altogether. I am sick and tired of having MPPs muzzled and handcuffed by the leaders of their parties. Under my administration every single vote in the legislature would be a free vote, because if I can’t count on the ingenuity and the initiative and the responsibility of individual MPPs why are they even there? And so by allowing individual MPPs once again to do what they were elected to do and that’s to represent their constituents and to vote according to what they believe is the right thing to do, I believe this will remove the cynicism from politics. We are all alike. We take the marching orders from the chief and then we walk out and we read their scripts. Not under my leadership. We are going to revive democracy in the province of Ontario and with your help we can do it through the PC Party of Ontario. I want to also do this. I want to invigorate our party membership. I believe that policy developed by our party should be developed by the grassroots. In 1991, I went to the floor of our annual general meeting and I moved a constitutional amendment that would require that every single platform piece in our platform as a PC party be developed by the grassroots, vetted by the grassroots, so that there would be no surprises. And when we develop policy that way, we win. And when we don’t, we lose. And I don’t know about you but I want to win the next election. And so we will in fact develop policy that way and we will develop policy based on the principles and values that define us as Progressive Conservatives. On the one hand is fiscal responsibility. If you have the ability to work and earn an income you have the responsibility to look after your family. On the other hand we believe in social responsibility. If there are people in our province who by virtue of disability cannot look after themselves, we collectively have a responsibility to look after those people. The balance of fiscal responsibility and social responsibility is what defines us as Progressive Conservatives. That’s the kind of leadership I want to bring to our party. That’s the kind of leadership I want to bring to the province. And when we do we will win and I look forward to forming the next government of Ontario with your help. Thank you very much Mr. Klees. Well our next candidate is Tim Hudak. He is the MPP for Niagara West-Glanbrook and he and his wife and young daughter live in Wellandport. He has a master’s degree in economics. He was first elected to the provincial legislature in 1995 and served as a cabinet minister in both the Mike Harris and Ernie Eves governments. He and his wife Debbie Hutton are the parents of a lovely daughter. So it is a pleasure to welcome to our podium Tim Hudak, the MPP for Niagara West-Glanbrook. Thank you very much Larry. Thank you ladies and gentlemen for joining us today. Thanks members of the Empire and Canadian clubs and the Ontario PC Business Association for organizing today’s event. My friends, Ontario is on the wrong track. We have lost some 300,000 well-paying manufacturing jobs under the Dalton McGuinty government, unemployment is pushing higher and higher and higher still and the budget deficit is forecast to be the highest in history, some $14 billion. And who in this room ever would have believed that the mighty province of Ontario would become a have-not province? Friends, I am running for the leadership of the PC Party of Ontario because like so many Ontarians I am deeply concerned about Ontario’s future under Dalton McGuinty and the Liberal government. I believe Ontario deserves far better. I want to be leader of our party and premier of this province because Ontario’s families want a premier who is dedicated to working night and day to building a better future than the one being built today. To overcome our problems today and restore Ontario to its rightful place as the powerhouse of economic growth and job creation for middle-class families, I believe we must stay rooted in our party’s conservative principles. Departing from those values, as some suggest, is not the way forward. The PC Party of Ontario wins elections and we speak plainly and offer conservative ideas that reflect the values, hopes and dreams of middle-class Ontarians. Values like rewarding hard work and ingenuity, support for our families, particularly those raising a young child at home, lower taxes and living within our means, support for the Canadian value of home ownership, respect for the rule of law. That’s what’s right for Ontario and that is what will bring the PC Party of Ontario to victory in 2011. I come from the middle class. I am the grandson of immigrants. My grandparents came from then Czechoslovakia to Ontario because they believed that if they worked hard and played by the rules they’d provide a better future for their children and their grandchildren. And because of their sacrifice I now come from that vast middle class. But that’s increasingly not the case for new Canadians in Dalton McGuinty’s Ontario. I first ran for office in 1995 because our province was being devastated by a deep recession and today, just like then, I want to make a difference. As an MPP for almost 14 years, I have concentrated on helping middle-class families by advancing solutions that encourage economic growth and job creation. And in government I was honoured to lead three economic ministries and while in office I always made a point of listening and learning, but when the time came to make a decision I provided the strong leadership necessary to meet the challenges head-on. I am proud to have served in the government that led Ontario out of a recession and created one million new jobs. And we achieved this because we put in place a solid plan based on our conservative principles and we did what we said we were going to do. Throughout this leadership campaign I have put forward a number of policies that are anchored in those middle-class values that stand the test of time, that built our province in the first place, and that can renew Ontario today. I’m proud to run on a platform of renewing those values and in the process renewing both our party and our province. I’ve called for an immediate one-year payroll tax holiday on new hires to encourage job creation. I’ve set a goal of having the lowest taxes on business investment in all of Canada. I want to end the picking of winners and losers by politicians by scrapping Dalton McGuinty’s corporate welfare programs. And I want to strengthen the incentives for individual responsibility and achievement to help the unemployed move from welfare to work. And Ontario’s middle-class families also value the family itself, particularly those with small children at home. Let’s let our party be their voice and do what’s right for those middle-class families. I propose that we allow each child in the province to start saving for the future by providing them with a $1,000 newborn savings account. I believe we must stop the government from penalizing parents who want to stay at home and work part-time and start allowing income-splitting for families with young children. And I want to help home buyers achieve their dreams today with a one-year freeze on the provincial land transfer tax and to help ensure that all children learn to read with a focus on phonics in education, and very importantly, make economic and financial literacy mandatory in our high school curriculum. At the end of June our party members will face a clear choice for leader among the four people you see before you today. Here’s where I stand. We will win if we choose a leader who has the energy to unite our party behind a truly conservative plan for 2011. We do not have to choose between winning elections and running on our conservative principles, in fact quite the opposite. Together united and strong we will focus on economic growth and job creation for middle-class families. Together united and strong we will defeat Dalton McGuinty’s Liberals in the next election and together united and strong we will turn Ontario around and make it the economic powerhouse in all of Confederation. Thank you very much. And now our fourth candidate, Randy Hillier. He represents the riding of Lanark-Frontenac-Lennox and Addington, which is in Eastern Ontario, one of the nicest parts of this province. Randy Hillier is a first-time MPP. He calls himself a libertarian. He lives in the town of Perth, is married, and he and his wife have four children. He is an electrician and recently was one of the founders of the Lanark Landowners Association, which was formed to help rural Ontarians in response to what he regards as over-regulation. Here’s Randy Hillier. Thank you very much Larry and thank you all for being here today. It’s been an absolute pleasure. 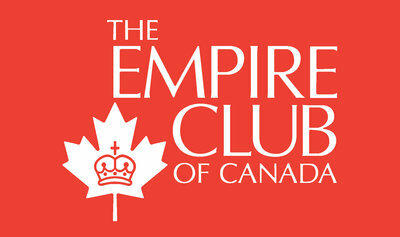 This is the first time I have been invited to speak at the Royal York Hotel on behalf the Empire and Canadian clubs. So thank you very much. I want to begin by stating what is probably obvious. I’m not a lawyer. I’m not an academic and I’m not a career or polished politician. I’m an electrician and I represent the people of Lanark-Frontenac-Lennox and Addington. And I’ve also learned that I’m the dark horse in this leadership race for the PC Party. Now over the years I’ve been called many things by the paper and press, but this is the first time I’ve been called the dark horse. So I just thought I would take a look and make sure I knew what a dark horse meant. And a dark horse describes a little known person or thing, which emerges into prominence. A dark horse is a racehorse that is unknown and is difficult to place odds on. But I’m in good company. Over the years there have been a few other dark-horse candidates. Presidents Abraham Lincoln, Hayes and Garfield were dark horses, as well as Prime Ministers Winston Churchill and the Iron Lady Margaret Thatcher. So I find myself in good company. But I would say if there are any gamblers here in the audience today don’t forget there is a dark horse in the race. And I also remind you that gambling is illegal in Ontario unless the bookie is a bureaucrat at the OLG. Now you might be wondering why any sensible person would want the leadership of the PC Party. With our track record lately it has not been an easy job to have. Many describe the job as herding cats and they’re right. That’s because Conservatives are independent, self-reliant and productive individuals. They need to be harnessed, not herded. You can herd Liberals just as you do sheep, but don’t try it with Conservatives. And that’s what the next leader of our party needs to do—harness this team of individuals, focus their energies, define their purpose, and motivate their ambitions to succeed. And whoever can do this will be the next premier of Ontario. We have had many leaders over the years who have tried to herd Conservatives and act as Liberals. They’ve always failed and they always will. We must learn not to repeat our mistakes. Thomas Edison has been said to have done 50,000 experiments, trying to invent the light bulb. At one point his assistant said to him, “It’s time to stop, “ because after so much work there were still no results. Edison replied to his assistant, “Yes, we have worked long and hard but the results are excellent. We have a list of 50,000 things that we know won’t work.” Like Edison, Conservatives have a long list of things we know that don’t work. But come election time, we often get a severe case of amnesia and develop a split personality. We become medicated by the media like the Toronto Star and others. We get sedated by our backroom advisors and then our pollsters and focus groups transplant our hearts and our minds, our passion and our reason, and replace it with pragmatism and caution. Let me share with you another observation about political advisors. The backrooms. Backroom boys and girls. They seek to keep candidates hidden from the media. They hand us our briefing notes and hold our hands so we don’t trip or stumble. Well I have no backrooms. My advisors are the forgotten people, the unheard people, the unseen taxpayers, the farmers, the businessmen, fathers and mothers and tradesmen. Chester Bowles, an American writer, said, “Government is too big and too important to be left in the hands of politicians.” And I agree. Elected representatives must leave the backrooms and take our advice from the kitchen tables. I started my career around the kitchen tables listening and that is still where I get the best advice. My last observation is this. We believe that the Liberals won the last election but we’re wrong. A party named “none of the above” got 48 per cent of the vote. People voted with their feet and chose to stay at home. Half the people did not see any value in voting for the major parties let alone the minor parties. What happened? A little thing called apathy. It is not a disease; it is what happens when “none of the above” is on the ballot. It is illustrated by the phrase, “Liberal, Tory, same old story.” It is what happens when politicians are out of sync with mainstream people, but in tune with the mainstream media. The next leader of the PC Party must create a party that reflects the view of everyday people. It must listen to those forgotten people. We must be unlike the others. We must defeat “none of the above” before we can win. The majority of people in Ontario are conservative by nature, although there are always a few exceptions out there. Some people will never vote for us because unlike you and I they like the nanny state. They enjoy the “cradle to grave” government comfort zone. They are not independent. They are not self-reliant. We know that what works for the Conservative Party is also what works for Ontario and Canada. It is the Conservative Party that protects our freedoms not with regulations and red tape but by abolishing the human rights tribunals, protecting our rights in real courts with real judges and protecting freedom of conscience; a Conservative Party that promotes justice and equality for all, not with perks and privileges but by ending government monopolies; a Conservative Party that listens and hears and acts for everyday people, not just big unions, big bureaucracies, and special interest groups; a Conservative Party that is full of honesty and is forthright and truthful. Not a party of spin, excuses and broken promises. Conservatives have been fearful of building a lasting Conservative Party, but I know that if we build it they will come. Who will build this party? It is your choice, but I know freedom, justice, and democracy are the heavily favourite groups. Thank you very much Randy Hillier. Well there you have it. The people who are putting themselves forward as potential leaders of the Progressive Conservative Party and indeed potential premiers of Ontario. We thank them very much and by the way I wanted to re-emphasize that this particular program has three sponsors—the Empire Club of Canada, the Canadian Club and the PC Business Association so thank you to all three of those sponsors. Well now it is time for us to sit back, enjoy some good food, some good drink, and perhaps think about what these candidates had to say. I know that in the years that I covered politics I actually came to believe that they are people who do want to do what is best for our country. So we thank them all for taking the opportunity to put themselves in front of the public and we wish them all well. Thank you so much for coming and enjoy your lunch. The appreciation of the meeting was expressed by Helen Burstyn, President, The Canadian Club of Toronto, and Chair, Ontario Trillium Foundation.